And here is…. another tasty chip review! I reviewed some tasty nut butters I was sent by Kettle Brand, and now it’s time to review the Aged White Cheddar and Hickory Honey Barbeque Chips I was also generously sent by Kettle Foods. Aged White Cheddar-1 oz (about 20 chips) is 120 calories, 3 grams of fat, 20 carbohydrates, 2 grams of fiber, 1 gram of sugar and 3 grams of protein. (pasteurized milk, cheese cultures, enzymes), whey, salt, cultured buttermilk, natural butter flavors, sugar, natural cheese flavors (maltodextrin, yeast extract), onion powder, cultured whey, lactic acid, garlic powder, citric acid. 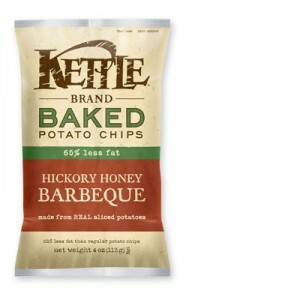 Hickory Honey Barbeque- 1 oz (about 20 chips) is 120 calories, 3 grams of fat, 21 carbohydrates, 2 grams of fiber, 1 gram of sugar and 3 grams of protein. sugar, honey), salt, onion powder, tomato powder, paprika, yeast extract, torula yeast, chili peppers, garlic powder, citric acid, paprika extract, natural hickory smoke flavor (maltodextrin, natural hickory smoke flavor). So, I opened up the jar, and actually was a bit taken aback at first- there was a LOT of oil on top! Which means it required some stirring to get it to a better consistency- I spent a few minutes or so. Which means, if you have one of those super-cool nut butter “stirrers” that you attach to the top of the jar- I reccommend using it! That way, it’s easy stirring for you, and none of the oil will spill. I also reccommend refrigerating this nut butter before eating it. I left it in the fridge for a few days, and while it wasn’t super stiff like I’m used to, it had a thicker consistency and was more workable. However, this consistency was PERFECT for drizzling! Those of you who love to drizzle peanut butter or almond butter on your oatmeal, toast, etc., this one will be PERFECT for doing so! Overally, this spread gets 4 stars. It certainly was unique and not quite like anything I have had before, but delicious and refreshing. However, I prefer my nut butters to have a little more thickness to them, (so it’s easier to eat straight from the jar of course!) and one serving provides only 4 grams of protein as compared to other nut butters that are a bit higher. 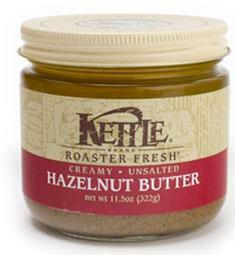 But, if you like hazelnuts, I highly reccomend this nut butter! I also did a review of Kettle Brand’s cashew butter, which you can see here. 1 oz (28g) is 180 calories, 17 grams of fat, 5 carbohydrates, 3 grams of fiber, 1 gram of sugar and 4 grams of protein. Seriously. I have had my share of bad nut butters in the past. In fact, I remember buying a cashew butter a few years ago. I went to the store with my mom, and I remember being SO excited when I spotted some cashew butter. Obviously, peanut butter has my heart, but my favorite 2 nuts are pecans and cashews (hey- how come they don’t have pecan butter??). So, I came home with the jar, took a big spoonful of it, and YUCK. It was horrible! Pasty, no flavor, and just wrong wrong wrong. YUMMY! It was so creamy and really tasted like someone took fresh, buttery cashews and grounded them up into this nut butter. It tasted like it had salt-but there was NON added!! Honestly, you don’t miss it a bit! It has a sweet aftertaste to it as well. I was perfectly content with the combination of spoon + jar +Lisa’s mouth= one happy camper! Overall, this nut butter is really excellent. It gets 4 1/2 stars in my book. Honestly, if you can’t have peanut butter for whatever reason , and are looking for alternatives, look no further than Kettle Food’s Cashew Butter! 1 oz (about 2 Tbs) is 160 calories, 14 grams of fat, 8 grams of carbohydrates, 1 gram of fiber, and 5 grams of protein.